There's been a lot of bards over the years, from the hot mess that was the 1E bard to the standardization of the 4E version. I'm going to combine a little bit of everything here, utilizing my Half Value Spellcasting and Ovatic Spellcasting rules. A little fighter, a little thief, a splash of mage and a pinch of druid. I'm cheating, really, reskinning my Fortune Hunter class. At the end of the day, they're both sides of the same die - versatile adventurers out to experience all there is, and probably steal some of it. Minstrel, skald, lyrist, archivist, rimer, allegorist, bard. There are many names across the world for the men and women who leave their homes, often never to return, spreading the history and legends of disparate cultures to all whom would listen. Every bard, knowingly or not, shares a common brotherhood, stretching back to antiquity. Sages posit that the bardic tradition began just as humanity was pulling itself up from an animal state, as a desire to have history and traditions took root in the mind. It survived subjugation by earlier, more advanced races as an undercurrent of hope, and continued to blossom into what it is today. In the wildlands amongst the barbarian tribes it appears as an ancestral tradition, tied in with the history of the group, and much closer to those primeval sources. In more civilized parts of the world, it may manifest as a guild or a college of learning, steeped in the understanding of the current day, yet still connected to a more soulful past. At first level, bards hit an unarmored foe (AC 0) with an attack throw of 10+. They advance in attack throws and saving throws by two points every four levels of experience, as thieves. Bards may wear leather armor or lighter, but may not carry shields. They can fight with a weapon in one hand, or with two weapons simultaneously but do not favor the bulk of two-handed weapons. Due to their breadth of training, bards are only familiar with a small subset of weapons, depending on their local traditions. They choose from any 2 of the following 7 categories: (i) axes; (ii) bows/crossbows; (iii) flails/hammers/maces; (iv) swords/daggers; (v) spears/pole arms; (vi) bolas/darts/nets/slings/saps/staffs; (vii) any combination of 3 weapons. They may use any magical item usable by thieves. Bards are a uniquely human affair. They are introduced to the arcane arts of the elves and other fey races, and at 4th level may begin casting arcane spells as a mage of one-quarter their character level, as on the class table below. Their unique take on arcane magic, as well as limited power, allow them to cast in any armor with which they are proficient. They also may dabble in the arcane, and attempt to use wands, staves, and other magic items only usable by mages. The bard must make a proficiency throw at 18+, or the attempt backfires in a way left to the GM's humor. The throw required reduces by 2 per level, to a minimum of 3+. Bardic tradition also has strong ties to druidism, that most ancient of ovatic magicks, and are the only people outside of the druidic hierarchy to know the druid's cant. At 1st level, the bard may cast as a druid of one-quarter their level, as shown on the class table below, in any armor in which they are proficient. Each bard, depending on the traditions of their culture, is trained in a specific type of performance, whether song, musical instrument, chant, or dance. Over time, this skill becomes weaved into the fabrics of the bard's spellcasting - bards may never learn the secrets of quiet magic. Their passion for their art and earnest performance of inspirational tales, poems, or songs allow them to inspire courage in their allies. Extorting their allies to greatness for one round (outside of battle) grants allies within 50' a +1 bonus to attack throws, damage rolls, morale rolls, and saves versus magical fear. This lasts for 10 minute (1 turn). The bard can only put on this sort of exhibition once per day per class level for any given character, and cannot affect characters already engaged in combat. Bards are introduced to a wealth of legends and lore, at at 1st level may identify ancient runes, artifacts, and recall esoteric history on a proficiency throw of 18+, which reduces by 1 per level. They have a love of ancient lore and obscure texts, and at 3rd level, they may read languages as a thief, with a proficiency throw of 5+. At 5th level, their thirst for rumor allows them to hear noises as a thief of their level - bard are forever seeking a new tales, tall or not, and their ears drink in all manner of murmurings. A bard who leads any of his henchman or hired mercenaries directly grant them a +1 bonus to their morale score, as the bard's presence assures they will be a part of his chronicles of battle, and they'll be responsible for their representation in tales and song. At 7th level, the bard's time spent studying the natural and unnatural world result in a knowledge of fey secrets, granting them a +2 bonus to saving throws. Upon reaching 9th level, the bard can establish a hall and rule his own domain. When the hall is complete, up to 1d4+1x10 0 level mercenaries and 1d6 bards of 1st-3rd level will come to apply for jobs and training. If hired, they must be paid standard rates for mercenaries. Please take a look at the ACKS rulebook for templates (pg 27, ACKSPC pg 60) and proficiency lists (ACKS pg 56) - no reason for more duplication of work. DESIGN NOTES: Less weapon wielding ability, as we're building off of Fighting 1a in order to abuse the class creation rules. A lot more versatility - both Arcane and Ovatic spellcasting are infinite-list repertoire based, so there's a lot of flexibility in spell choice that should make for interesting play. It's expensive to manage though. And we don't give up anything from the default ACKS Bard, except needing a few more XPs to level. Traditionalists may wish to limit this Bard to Illusion spells - there's a fan-submitted Illusionist on Autarch's site that would get you there. So. I've been sitting poking at this for a while, I'm gonna throw it on the wall and see what happens. Spell progression is the OSRIC/1E Druid, aside from just one spell at 1st. Spell Level is limited to 5, as an ACKS divine caster. Memorization mechanics are as a ACKS arcane caster. With an extra requirement, can cast 8th and 9th level rituals as an ACKS arcane caster. Hopefully that all balances out? I'd welcome feedback from those more experienced. Some of the conceptual text on this is tying into where I'm currently at in my brain in world-building, where divine magic comes from other powers, arcane magic comes from other places, and this ovatic magic comes from this Earth beneath our feet. So it would make more sense in some ephemeral sourcebook that also has a campaign world attached to it that I'd never write nor show anyone if I did. Or I just feel like typing pretty. There is, then, a third type of spellcasting, separate from those divine practitioners beseeching their sun-eyed god for succor, and the arcanists in their towers, learning the secret structures of the universe from distant voices best left unheeded. That type is Ovatic, a magic that comes to us from here, this Earth. From the great whales of the oceans and oliphaunts of the savannahs; from the industrious ants and the parasites of the gut; from the mighty sequoia and redcap toadstool we draw these magicks. From you, and from I; from our love, and our hate, our joy and our pain, we draw these enchantments. 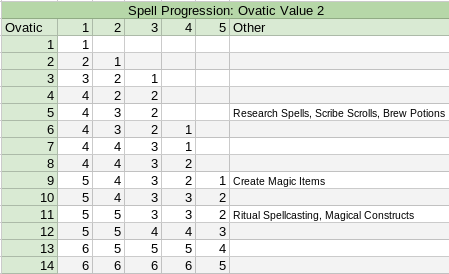 The number and levels of spells the ovatic caster can use in a single day are listed on the Ovatic Spell Progression table below. An ovatic caster's spell selection is limited to the spells in her repertoire. The repertoire includes a number of spells up to the number and level of spells listed for her level, increased by her Wisdom bonus. As an example, Lia, a 3rd level ovatic caster, is able to cast three 1st, two 2nd, and one 3rd level spell per day. Her repertoire, as her Wisdom is 14, may hold four 1st, three 2nd, and two 3rd level spells. There was a brief flirtation with making Charisma the casting stat. Charisma's already got a lot going for it in the stat space, what with henchmen and reaction rolls, and I'd rather a ovatic casting class like a witch that's supposed to be beguiling happen naturally via class build or preferably, play, rather than enforcing it on one that isn't described as such by emphasizing Charisma. Ovatic spellcasters have a limited repertoire of spells - the base number and level of spells is equal to the number she can cast per day, increased by Wisdom. Ovatic casting is passed along via verbal, musical, or somatic training. These rituals are recorded symbolically, in glyphic codes and patterns, on tablets, skins, beadwork, or any number of materials and presentations depending on the traditions of the class, for use as mnemonic devices. The spellcaster keeps these devices on her person to review occasionally to refresh her memory of the spell's requirements. A 1st level ovatic spellcaster starts the game with one 1st level spell in her repertoire, plus additional up to her Wisdom bonus. As they advance in level, ovatic spellcasters may add spells to their repertoire in different ways. Depending on the class, the spellcaster may be a member of a circle, a coven, or some other grouping where she can return to receive further knowledge. Their compatriots will teach them spells equal to the number they can learn and cast in a day, and the process will take one game week per spell. If an ovatic spellcaster's devices are lost or destroyed, she may begin to lose spells from her repertoire. Each week the devices are lost, the ovatic spellcaster loses one spell level from her repertoire. The spellcaster may recraft the devices through research and memory at a cost of 1 week of game time and 1,000gp per spell level. If the spellcaster did not have the spells from the devices in her repertoire at the time, those spells are lost until refound or researched. An ovatic spellcaster with a full repertoire may elect to replace a spell with another of equal level. It takes a week of game time and 1,000gp per spell level to replace the spell. It takes complete concentration to recraft devices or replace spells, and the spellcaster can do no other activity while this takes place. Ovatic spellcasters may accrue ovatic power to aid in their research and ritual casting just as other divine casters. This power is accumulated during Sabbats or other gatherings - these gatherings may take any form, from quiet retreats to raucous bacchanalia, depending on the tradition of the spellcasters involved, the season, location, or other factors. Some may not be limited to witches in attendance, as well - it was long rumored the 'Carnivale' celebrations in the kingdom of Pulane were put on by an ancient witch's coven, destroyed by the last king of the old family hundreds of years ago. The Red Silk House in Punajar, on the other hand, is known to be ran by a coven of a more prurient nature. These are, by nature, smaller, and often secret, affairs - there are not large congregations to draw from. Instead, during these gatherings, the ovatic caster may draw up to 1GP worth of ovatic power per day from every 25 participants, all of whom must be ovatic spellcasters. So, if you take the 10GP per 50 ppl per week of the regular Divine Power rules, that's ~1.4 GP/day, or, ~3CP/day/person. Taking that back up, that's almost 1 GP (rounded up from .71GP) per day per 25 people. I want these sabbats to be small, localized affairs, or, in the case of the Red Silk House flavor text, something secretive that's always going on in the background, that can provide plot hooks or a world-building tool. I'd expect in a culture where an ovatic spellcaster could rule a domain, the GM would switch back to the usual "Divine Power" rules, since there could be a regular congregation at that point. Ovatic rituals follow the same rules as divine rituals, with one important distinction - ovatic rituals may reach to the 9th spell level. To transcend into the 8th and 9th levels however, require special circumstances. A triptych must be formed of the caster, and two other ovatic casters of at least 11th level. Every part of the research and casting of these higher level spells must be performed by the entire triptych, and the membership of that triptych may not change for the duration. Any experimental mishap affects all of the casters involved in the ritual. OPTIONAL RITUAL EXPANSION -- I'm not really sure how useful this is except as a plot point, but it got stuck in my head because I started remembering the show "Charmed" (or, certain elements of the show at least, if you know what I mean, and I think you do - my wife watched it for the plot) and the phrase "the power of three". I'm imaging some Chaotic order of ovatic casters, perhaps thinned down by the PCs themselves, gathering everyone they could in a last, possibly suicidal effort to drop a Cataclysm on the PCs' domains. Under special circumstances, the triptych may be expanded. Throughout history, ovatic casters have occasionally been persecuted for real or imagined slights. In times of desperation, ovatic casters may cast 8th and 9th level rituals (often for self defense, many times in vengeance) utilizing whatever members of their order they can collect. The caster may be accompanied by 2 ovatic casters of at least 9th level, and each of the other members replaced by three casters each of at least 9th level (the triptych in this case consists of the primary 11th level caster, and 8 others of at least 9th level). This is a triptych novem, and there is a -1 penalty to any rolls to research or cast the ritual. A tria triptych novem consists of an 11th level caster, accompanied by 6 ovatic casters of at least 7th level. Two groups of 9 ovatic casters of at least 7th level round out the expanded triptych. When casting rituals in this manner, there is a -2 penalty to any research or casting rolls, and if the roll fails, the caster must roll on the Minor Mishap table on Page 100 of the ACKS-PC. This mishap will affect everyone involved in the ritual. A novem triptych novem consists of an 11th level caster, accompanied by 18 ovatic casters of at least 4th level. Two groups of 27 ovatic casters of at least 4th level round out the expanded triptych. When casting rituals in this manner, there is a -4 penalty to any research or casting rolls, and if the roll fails, the caster must roll on the Major Mishap table on Page 100 of the ACKS-PC. This mishap will affect everyone involved in the ritual. A triptych letalis consists of an 11th level caster, accompanied by 54 ovatic casters of at least 1st level. Two groups of 81 ovatic casters of at least 1st level round out the expanded triptych. (A total of 217 ovatic casters are involved in this ritual!) When casting rituals in this manner, there is a -6 penalty to any research or casting rolls, and if the roll fails, the caster must roll on the Catastrophic Mishap table on Page 100 of the ACKS-PC. This mishap will affect everyone involved in the ritual. When building custom classes, the Ovatic Value determines the extent of the class's ovatic spellcasting abilities. Assign 0 to 4 points to the class's Ovatic value, noting the appropriate powers and XP costs. The XP costs are based on OSRIC's Druid - it'd have HD 1, Fighting 1, and Ovatic 2. 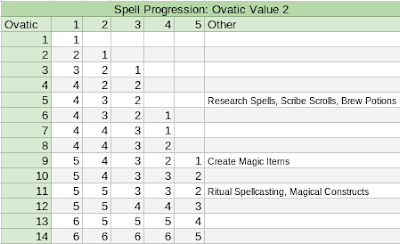 Ovatic 1: An Ovatic value of 1 gives the class the ability to understand their order's secret cant, and grants 1/2 a custom power, as well as the spellcasting ability of a ovatic spellcaster of 1/2 the character's actual class level, rounded up. As an example, at 5th level, the class has the abilities of a 3rd level ovatic caster. The class uses it's effective caster level (1/2 class level) for all level-dependent spell effects. Ovatic 2: At an Ovatic Value of 2, the class may cast spells as an ovatic caster of their level. They gain the ability to understand their order's secret cant, and gain a custom power. Ovatic 3: At an Ovatic Value of 3, the class may cast spells as an ovatic caster of their level. They gain extra spells - increase the class's spells per level by 1/3rd, rounding fractions of 0.5 of more up. Any level-dependent spell effects are still calculated at their regular class level. They gain the ability to understand their order's secret cant, and gain one and one half custom powers. Ovatic 4: At an Ovatic Value of 3, the class may cast spells as an ovatic caster of their level. They gain extra spells - increase the class's spells per level by one half, rounding fractions of 0.5 of more up. Any level-dependent spell effects are still calculated at their regular class level. They gain the ability to understand their order's secret cant, and gain two custom powers. 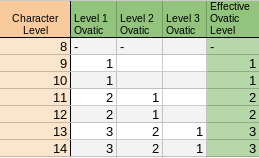 Ovatic Experience Points Per Level: After 8th level, an ovatic caster (saves as a cleric) will instead add an additional 130,000 XP per level. The 1E/OSRIC Druid gains "+2 on saves versus Fire and Electricity", which I'm currently eyeballing at being worth a half a power (or less, really) as a regular +2 on all saves is a full power. I'm also treating the secret cant as half a power. I'm not in love with this idea at the moment, but I'm trying to balance the removal of Turn Undead and the addition of more spellcasting power. All custom classes with Ovatic values of 1 or more will have a code of behavior - the higher the value, the more restrictive the code. Ovatic 1: The code will impose certain behaviors on the class, including such things as dress restrictions, bans on certain behavior, dietary restrictions, specific rituals that must be followed, and a code of silence and secrecy about the workings of their order. Ovatic 2: Additional rules imposed will involve restrictions based on the organizational structure of the ovatic caster's order. For example, there may be an order-imposed restriction on how many members of the order may exist of a certain title in some geographic area. Additionally, there may be rules on how an ovatic caster may occupy a restricted title already claimed, often by defeating the a current holder of that title in physical or magical combat. Also, the caster's order may expect certain behaviors of the class, with regards to the eternal contest between Law and Chaos - including a focus on Neutrality. Ovatic 3: The code will enforce additional restrictions, such as pacifism, poverty, or silence. The class may be precluded from taking the life of a certain class of lifeforms. Ovatic 4: The class's devotion to their order is absolute, and supersedes any other desire. Details may be left to the GM, but the author does not recommend making a playable class with Ovatic Value 4 unless agreements can be reached with the player. In other words, Ovatic Value 4 was inserted here only to match up with the other Build Point Categories, as this author cannot think of something restrictive enough that will co-exist with a class who would also like to adventure freely. NPCs, of course, are another matter. Vapor lock on Ovatic 4. A PC would get a *lot* of spells - 2 at first, 6/6/5/2 at 7th, 9/9/9/9/8 at 14th. I up-leveled the restrictions as presented in the Divine writeup, as at Ovatic 2 I wanted to be able to enforce the 1E/OSRIC Druid's restrictions, but then couldn't think of anything compatible with an adventuring class for Ovatic 4, since I already equated Divine 4 with Ovatic 3. The ACKS Player's Companion provides a framework for creating custom spells or modifying existing spells. When choosing existing spells for an Ovatic caster class, look to what the order the class belongs to for inspiration, and choose accordingly. For custom spells, it may be helpful to pick for each spell power category if the ovatic class in question would be more like an Arcane or Divine caster - for example, a "Witch" ovatic class may develop Enchantment spells as an Arcane Source for "enchantments other than hold", and also develop "hold" spells as a Divine Source, thereby gaining the best of both sides, emulating this "Witch"'s skill at enchantment. Alternatively, you may alter multipliers specially for the class. A Druid may have a x0.8 modifier to summoning animals, and a x1.5 modifier for any other creature type when developing a Summoning spell. Half-Value spellcasting for Arcane and Divine spellcasters was presented here. Next are the tables for splitting Ovatic spellcasting with another type. The progression of half-value ovatic spellcasting, for effective level, mirrors that for the Arcane from the previously linked post. If alternating spell levels are desired, delay Effective Ovatic Level 1 until character level 5. Delaying half value ovatic spellcasting can be accomplished in two ways. The default first method mirrors the Arcane table from the previous post. Delay Effective Ovatic Level 1 until 10th to offset the progression. ALTERNATIVE 1: If the class is to only advance in half value ovatic spellcasting, grant the class one extra class power/proficiency point. ALTERNATIVE 2: The class may delay it's progression further, as outlined in the earlier post. This second method grants an additional level in return for the long wait. I was going to just make this an example druid, but, that's boring and expected. I'll do one later, since I've got another custom Stronghold idea for that class. The men and women of the Red Silk House in Punajar are known the world over for their dedication to the prurient arts. Prized as consorts for the powerful and wealthy, a Red Silk Ecstatic can be found in the concubine rooms of emperors, queens, merchants and priests. Red Silk Ecstatics also travel as part of their seminarial duties, and are often found as companions at public events or simply a private night of proselytizing. Last sentence: Think of this as the Companions (Inara) from the Firefly universe, if they were also an order of witchy casters? The Red Silk House prides itself on discretion and neutrality. Its reputation is so strong in this regard that officers of the House are often called upon to be arbiters of disputes amongst the lords of the Sunward Reaches, and often to judge contracts. While the House is discrete to the public, pulling away the silks reveal a house of priests and prophets of the power of lust and ecstasy - in fact, the House itself is but a power nexus for ritual spellcasting, and visitors to the house unknowing participants. The secrets their acolytes learn out in the field and in the bedroom are never shared outside the House, but, woe betide one who harms or cheats an Ecstatic, as they often find things going very badly for them. Ecstatics are trained in weapons. At first level, Ecstatics hit an unarmored foe (AC 0) with an attack throw of 10+. They advance in attack throws and saving throws by two points every four levels of experience, just as clerics. Ecstatics are only trained in the use of swords and daggers, a very narrow selection of weaponry. They may fight with two weapons, but are not trained with shields, nor in using two-handed weapons. Ecstatics value freedom of movement, and may only wear leather armor or lighter. They may use any magical item usable by ovatic casters. Ecstatics have learned the secrets of the Red Silk House before leaving to begin their more worldly lessons. At 1st level, they understand the ecstatic's cant, a language of words and signs all Red Silk House members know. They know the secrets of the red silk, and begin play proficient in the performances and rituals expected of travelling members. They learn to downplay their spellcasting, and are able to hide their magical abilities with quiet magic. Ecstatics gain spells at the regular progression for ovatic casters. At third level, ecstatics are able to effect a glamourous aura, awing and seducing those in her presence. She gains a +2 bonus to reaction rolls to impress and intimidate people she encounters. If this bonus results in a total of 12 or more, the subjects act as if charmed while in her presence. At 5th level, the ecstatic may percieve the intentions of creatures, reading them as an open book. She will always know the exact reaction result (Hostile, Unfriendly, etc.) of creatures she interacts with, even if the creatures attempt to lie or conceal their reactions. Creatures with a CHA greater than the ecstatic’s WIS are immune to this power (and the ecstatic will know they are immune). The ecstatic, at fifth level, may also begin researching spells, and may craft potions and scrolls. At 7th level, the ecstatic's mastery of charms and illusions is complete, and when the she casts charm spells (such as charm person) or illusion spells (such as phantasmal force), the spell effects are calculated as if she were two class levels higher than her actual level of experience. Targets of his charm spells suffer a -2 penalty to their saving throw, as do those who attempt to disbelieve the ecstatic's illusions. At 9th level, an ecstatic may establish a safehouse. A safehouse is similar to a hideout, but even more secret. Safehouses may not be used to hold a domain, nor does it attract followers. Instead, at the time the safehouse is established, the Red Silk House sends the ecstatic an apprentice of the rose collar (5th level). The apprentice must be paid as any other henchman, but does not count against the number of henchmen the ecstatic may hire. The apprentice is not utterly loyal, but does start with a +2 to any future morale rolls due to the bonds of comradeship in the Red Silk House. If the apprentice is lost or driven away, another may or may not be sent by the Red Silk House depending on the circumstances. The ecstatic must gain a level before another apprentice may be sent. No other henchmen in the employ of the ecstatic can be Red Silk Ecstatics. The ecstatic may hire ruffians that can be deployed on hijinks. With sufficient gold, any number of safehouses may be established, and there is no requirement that the safehouse be a stationary structure. At 11th level, the ecstatic may learn and cast ovatic ritual spells of great power (6th and 7th level), as well as forming a triptych to cast ritual spells of the 8th and 9th levels. She may craft magical constructs such as golems and animated statues..
Ecstatics live by a strict code. They must always comport themselves with the dignity and mannerisms expected of a Red Silk House member when amongst civilized folk. They must keep the inner workings of the House secret, upon pain of death, and may not use the resources of the House for personal gain. Their personal resources must be left to the uses of the House upon request. In all ways, the House must come first in their decision making. In return, the House offers resources and protection - wronging a Red Silk Ecstatic comes at a high price to the offender, in most cases much more than just the withdrawal of any House services for that person and the next two generations of their descendants (the minimum penalty) - which, in certain cultures around the world, is a crippling loss of face and status. The House has certain organizational limits. At any given time, there may be only 1 House Mistress (Master) of 14th level. There may be only 3 Lady/Lord Ecstatics (13th level), and 9 High Ecstatics (12th). When a Red Silk House Ecstatic has enough experience points to reach that level, they must petition the House to replace that member with themselves. The internal politics of the House are often...messy, and may devolve into single combat or assassination faster than one would expect of an establishment of such exterior refinement. The replaced member, if alive, is reduced to the next lowest level, which may cause a chain reaction of replacements if the next lower level is also contested. Ecstatics may choose to leave the House, but they are forever exiled, and their lives are forfeit, leading many to the far fringes of civilization. Exiled ecstatics may establish strongholds as normal, if they think they can keep their previous lives secret enough. DESIGN NOTES: Nothing of note. TRADEOFFS: The allowed Ovatic proficiency was used on Perform. Weapon Style:Shield traded for Quiet Magic, and armor was taken from Broad to Narrow for powers at 3,5,7. HOUSE RULES USED: This whole document is a house rule.